The prevailing assumption within the medical, government, pharmacology and science communities is that vaccines are safe and effective. Those who question that foundation are said to be relying on quack science. To have a open conversation about the potential dangers of vaccination, we must understand the science behind vaccines. There is no doubt that government health agencies, the medical establishment, the pharmaceutical industry, most mainstream science authorities and the majority of media sources agree that vaccination is one of modern medicine’s most important tools for protecting the population from infectious diseases. The frantic push to develop a Zika vaccine—before it has even been established that the usually mild Zika infection is actually behind the upsurge in cases of microcephaly among newborns in Brazil—is a prime example of that deeply held belief. But how much is truly understood about vaccines or the vaccination process? But because the underlying assumption is that, “decades of research from hundreds of medical, government and nonprofit organizations around the world have proven time and time again that vaccines are safe and effective,”2 there is very little taught in medical schools about vaccination itself, aside from its accepted role as a hero of public health programs. The foundation of belief is such that it isn’t considered necessary to examine the science behind vaccines, the rationale for vaccinating, the steps or ingredients involved in creating a vaccine, how vaccination stimulates artificial immunity, or the ways in which vaccination affects the immune system as a whole. For medical doctors teaching prospective doctors in medical schools about vaccination, it has been enough to say that vaccines are necessary, safe and effective. What Do We Know About How Vaccines Are Created? Live virus vaccines are made up of attenuated, or weakened strains of the microbe. In the case of an attenuated vaccine, the virus is “passed through” a host cell (such as a chick embryo cell line) over and over. With each pass, the virus becomes more adept at replicating in the host cell but less able to proliferate in human cells, so less likely to cause illness. Examples of live virus vaccines include measles, mumps, and rubella (MMR), varicella (chickenpox), rotavirus, and the nasal spray influenza vaccine, as well as zoster (shingles) and yellow fever vaccines. One of the dangers with a live attenuated vaccine is the possibility that the weakened virus strain may mutate to a more dangerous form after it is shed in body fluids of a recently vaccinated person, as has occurred with the live oral polio vaccine (OPV). Globally, widespread use of OPV has caused vaccine strain polio paralysis in children and adults and contamination of sewage and water supplies with mutated vaccine strain poliovirus. There is evidence that most live virus vaccines can cause vaccine strain infection, shedding and transmission of vaccine strain virus.6 The U.S. stopped using OPV in 1999 and now uses an inactivated, injectable polio vaccine (IPV) that cannot cause vaccine strain polio. Inactivated or killed bacterial and viral vaccines have traditionally been created using either heat, chemicals or radiation to inactivate the bacteria or virus and, today, genetic engineering technology is also being used. Inactivated vaccines are more stable than live virus vaccines because the dead microbe cannot cause vaccine strain infection, shedding and transmission like live virus vaccines. However, any protection inactivated vaccines offer to the vaccinated person is also weaker, so it is shorter-acting and usually require booster shots. Inactivated bacterial and viral vaccines are also likely to include an adjuvant, which is added to stimulate the immune system to mount a stronger inflammatory response that is supposed to provide longer lasting vaccine immunity. Inactivated vaccines packaged in multi-dose vials many also include a preservative to prevent bacteria, fungi and other microbes from contaminating it. Examples of inactivated vaccines used in the U.S. include pertussis (included in DPT/DTaP/Tdap vaccines), killed polio (IPV), injectable influenza, hepatitis A and rabies. Submit and conjugate vaccines include antigens that are thought to best stimulate an immune response, such as isolated proteins from the microbe, rather than the whole microbe. Like inactivated and toxoid vaccines, subunit and conjugate do not cause vaccine strain infection, shedding and transmission of the lab-altered microbe, as is the case with live virus vaccines. 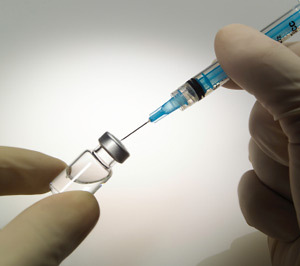 Examples of subunit vaccines include the inactivated injected form of the influenza vaccine, Haemophilus influenza type b (Hib), and acellular pertussis (included in the combination DTaP/Tdap vaccines). Genetically engineered recombinant vaccines are another type of subunit vaccine and are made by using in which the microbe’s genes that code for important antigens to stimulate an inflammatory immune response. For example, to make the recombinant hepatitis B vaccine, scientists inserted hepatitis B genes into common baker’s yeast and the yeast produced the antigens that were collected and purified for inclusion in the vaccine.7 Genetic engineering was also used to create the human papilloma virus (HPV) vaccine, employing a slightly different process that created virus like protein particles (VLPs) designed to stimulate vaccine immunity. The bacterial conjugate vaccines are similar to recombinant vaccines but use pieces of an outer coating of sugar molecules from a bacterium (polysaccharides) linked to antigens or toxoids from the microbe. Examples of conjugate vaccines include Haemophilus influenza B (HIB), pneumococcal and meningococcal vaccines. Experimental DNA and recombinant vector vaccines are in development. Scientists creating DNA vaccines take the genes from a microbe and use them to code for the microbe’s antigens. DNA vaccines will insert microbe DNA directly into cells of the body to stimulate an inflammatory immune response. There are several components to vaccines, identified as antigens, stabilizers, adjuvants, antibiotics, and preservatives, and reviewed below as described by the World Health Organization (WHO)9 (Not all vaccines include all of these components). The vaccine product manufacturer insert that accompanies vials of vaccines administered in private doctor offices or public health clinics are required by U.S. law to list vaccine ingredients (see Diseases and Vaccines pages on NVIC.org to read or download vaccine manufacturer product inserts). The foundation of a vaccine is the antigen itself, defined as “any substance that causes your immune system to produce antibodies against it… An antigen may be a substance from the environment, such as chemicals, bacteria, viruses, or pollen. An antigen may also form inside the body.”10 The antigen is the segment of the disease organism that is recognized as “foreign” (non-self) by the body’s immune system and thus activates the inflammatory response. In the U.S. and most other countries, however, the most commonly used vaccine adjuvants, at least in human vaccines, are aluminum-based (alum) and squalene (oil in water). Aluminum adjuvants are found in hepatitis A, hepatitis B, diphtheria-tetanus-pertussis (DTaP, Tdap), Haemophilus influenzae type b (Hib), human papillomavirus (HPV) and pneumococcal vaccines. The Novartis Fluad influenza vaccine recently licensed by FDA for seniors contains a squalene adjuvant (MF59). An emergency stockpiled pandemic influenza A (H5N1) vaccine has been licensed that contains AS03, but it is not commercially available. The HPV vaccine, Cervarix, contains AS04, an adjuvant that is a combination of aluminum hydroxide and a purified fat-like substance, monophosphoryl lipid A (MPL). Stabilizers are added to preserve effectiveness of the vaccine, especially where the “cold chain” cannot be guaranteed. Instability in a vaccine can be caused by several factors, including changes in temperature or pH values and can interfere with the potency or actions of the vaccine. Common stabilizers include MgCl2 (for the oral polio vaccine), MgSO4 (for measles), lactose-sorbitol, and sorbitol-gelatine. Antibiotics may be used during the vaccine manufacturing process to prevent contamination of the vaccine by bacteria that may have been present in the virus growth cultures. Though very small amounts of antibiotics are in some vaccines, WHO cautions that, for example, “Persons who are known to be allergic to neomycin [for example] should be closely observed after vaccination so that any allergic reaction can treated at once.”19 Other antibiotics, such as neomycin, polymixin B, streptomycin and gentamycin, are also found in trace amounts in different vaccines. Preservatives in inactivated vaccines today are primarily found in “multi-dose” vials that are (designed to hold multiple doses of vaccine withdrawn from the vials with syringes to be administered to more than one person. Preservatives are added to help prevent any bacterial or fungal cross contamination that could occur when syringes are inserted multiple times into the vial to withdraw vaccine for each person. Preservatives also help protect against the growth of any toxic microorganisms during the manufacturing process. Examples of the types of preservatives used in vaccines include the mercury compound, Thimerosal, as well as formaldehyde and phenol derivatives. Single-dose vials (those designed for use one time, on one person) generally do not require preservatives, although there may be trace amounts of preservatives in single dose vials of vaccine left over from the manufacturing process. Vaccine ingredients considered to be inactive or inert are defined as excipients, although there is disagreement about which vaccine ingredients should be classified as excipients without biological effects. Unfortunately, most vaccine ingredients have never been tested separately for safety when given separately or co-administered. Unfortunately, many of these ingredients are neither inactive nor inert and may have a profound effect on the immune and neurological systems. The first stage involves either growth and harvesting of the microbe (inactivated later) or using DNA technology to create a protein derived from the microbe. Viruses are grown in cell cultures (chicken embryos for example), while bacteria are reproduced in “bioreactors,” using a growth medium. The second stage is to free up the virus or bacteria and separate it as much as possible from other substances found in either the cell line or the growth medium. Next, the antigen is purified. At that point, any other ingredients to be included in the final vaccine are added to the antigen, including the adjuvants, stabilizers, and preservatives. Before a vaccine is considered ready for distribution, it is mixed in a large container to ensure uniformity, and then packaged into sterile single- or multiple-dose vials. The concept of vaccination as the cornerstone of disease prevention has been so thoroughly accepted by so many for so long that in most circles it is considered unacceptable to even suggest that there is much more to learn and there are two legitimate sides to the debate about the value versus the dangers of vaccination. The best hope we have of keeping the conversation going and counteracting the derision and dismissal that faces anyone with questions about vaccination is to arm ourselves with as much credible information as we can find. Only when we truly understand assumptions and myths about vaccination can we gain perspective and offer valid arguments based on solid science. 1 Raff J. Yes, Doctors Know What They’re Talking About: Refuting a CommonAntiVaccine Argument. Violent Metaphors (blog) Nov. 30, 2014. 3 Sears RW. Inside the Vaccine Book. Ask Dr. Sears, discussion on his book, The Vaccine Book: Making the Right Decision for Your Child Oct. 26, 2011. 4 Humphries S. Smoke, Mirrors, and the Disappearance of Polio. International Medical Council on Vaccination Nov. 17, 2011. 5 The History of Vaccines. Different Types of Vaccines. The College of Physicians of Philadelphia 2016. 6 Fisher BL. The Emerging Risks of Live Virus and Virus Vectored Vaccines: Vaccine Strain Infection, Shedding and Transmission. NVIC.org November 2014. 7 National Institutes of Health. Types of Vaccines. NIAID Apr. 3, 2012. 9 World Health Organization. Components of a Vaccine. Vaccine Safety Basics C 2016. 10 Medline Plus. Antigen. U.S. National Library of Medicine July 15, 2015. 11 World Health Organization. Components of a Vaccine. Vaccine Safety Basics C 2016. 12 Petrovsky N, Aguilar JC. Vaccine Adjuvants: Current State and Future Trends. Immunology and Cell Biology 2004. 13 Petrovsky N, Aguilar JC. Vaccine Adjuvants: Current State and Future Trends. Immunology and Cell Biology 2004. 14 World Health Organization. Squalene adjuvants in vaccines. WHO.int Dec. 3, 2008. 16 Kuroda Y, Nacionales DC et al. Autoimmunity induced by adjuvant hydrocarbon oil components of vaccine. Biomed Pharmacol 2014; 58(15): 325-327. 17 NVIC Questions FDA Fast Tracking of Squalene Adjuvanted Flu Vaccine. The Vaccine Reaction Sept. 16, 2015. 18 U.S. Centers for Disease Control and Prevention. Vaccine Adjuvants. Aug. 28, 2015. 19 World Health Organization. Components of a Vaccine. Vaccine Safety Basics C 2016. 20 Institute for Vaccine Safety. Vaccine Excipients. Johns Hopkins Bloomberg School of Public Health May 28, 2014. 6 Responses to "Understanding the Rationale Behind Vaccines"
There is a lot of great information here, which I appreciate. However, it would also be easy for the reader to get the impression that vaccines have some value, or some ability to create immunity. I see no evidence that is true. As far as I can tell from studying vaccines throughout their history, they have never prevented even a single disease, but have started and spread many deadly epidemics, right from the start, and they still do. The idea of injecting toxic materials directly into the body past its normal defenses is not valid. The presence of “antibodies” does not correlate to immunity. Many people who have high antibody counts still get the disease, often from the vaccination itself, which is not a surprise at all, if you just look at what vaccination actually is. Other people with low antibody counts have great immunity. The whole thing is 100% potentially lethal hoax. Vaccines are, however, as Bill Gates inadvertently pointed out, effective at reducing population. They are also great at causing sterility and a long list of “adverse reactions.” It is time for people to stop being impressed with costumes, degrees and unintelligible language, that is supposed to be impressive. At one time there used to be a great quality we possessed called “common sense.” It is usually possible to recover it gradually with perseverance. The antibody theory of immunity is fraud. Once that is really understood, it pretty much clears up the entire issue. The people pushing vaccines should be tried for crimes against humanity. Anything less is self-deception on our part. There is no excuse left to be this naive about what is going on. Real immunity can be acquired by totally natural means. The information on specifically how to do this is violently suppressed by the same people pushing the vaccines, the drugs and the misinformation, designed to keep us all sick, addicted to medical drugs and degenerating into an often hellish old age that we are supposed to believe is normal. It is not. The body is self-repairing. If it is degenerating, it is because we are not taking care of it properly and giving it what it needs. It was designed to stay healthy and in good shape until we are done with this life, ready to move on. We cannot afford to take forever to figure this out. Those in control plan to use vaccines and many other weapons in their arsenal, to make things a lot worse than they are now. If we don’t want this to happen, we have to get past this infantile stage of thinking vaccines are anything other than what they are, and the same with many other problems, all coming from the same small cartel of global rulers, using their naive minions to carry out the gradual murder that their agendas involve. At the top levels, this is not about money. The population control enthusiasts have found a way to inject past all a person’s natural bodily defenses, substances that will actually create conditions and diseases that will help fund the Allopathic community and also serve to cull the population. Saved as an invaluable resource; even after more than forty years of reading about this topic, this article is worth its weight in gold! Thanks so much! Great information….any doc who reads this is slack jawed afterwards I’m sure. The other lie by omission, that supports the fraud of vaccination is the suppression of the role of epidemiology in public health. The process by which a microbe/pathogen spreads in a population, rises to it’s height, subsides as the population forms immunity and then disappears or subsides to irrelevance. It is a necessary part of determining whether a pathogen is the cause of that outbreak, and where the reservoir is….along with Kochs Postulates. The sound and accepted rules of epidemiology must be applied…but they get in the way of the agendas of the pharma corps revolving door with the CDC/NIH/AMA/APA etc….and the PR storm complements of the U.N./WHO prevaricators. All which start the money flow in great sums. Just an example of Kochs Postulates if it were applied to the Zika virus. Zika fails – It is not found growing abundantly in every pregnant woman who has just had an infant with microcephaly. Zika may pass – The virus taken from infected mothers who are pregnant must be isolated and grown in the lab, without growth additives. Zika fails – The purified pathogen must create the same disease when injected in another host….and in the case of Zika that host, a pregnant woman, would have to have a baby with microcephaly. Zika fails? The same pathogen must be found in abundant quantities in the new host. Of course the real problem the CDC can’t explain is that because microcephaly has many causes, has been around for a long time and has never been associated with a virus before, why now? http://mcb.berkeley.edu/labs/duesberg/ – His papers on cancer being Aneuploidy, not gene mutation. “Dissolving Illusions – Disease, Vaccines, and the Forgotten History” by Suzanne Humphries MD and Roman Bystrianyk – Disease researcher. The numerous viruses we are seeing in these times supposedly causing all sorts disease are, more than likely, genetically modified just as the mosquitoes that have been released in Brazil prior to the “outbreak”. Read Len Horowitz’s book, “Emerging Viruses: AIDS & Ebola; Nature, Accident or Intentional”. Yoichi Shimatsu, is a science writer based in Hong Kong. He organized a public education committee of microbiologists during the SARS and avian influenza crisis. He also wrote extensively on the Ebola scare last year. His writings contain accurate information as I have checked them out. Part of the rationale of vaccines occurred when Dr. Jenner tried using cowpox from infected cows to stave off smallpox. Dr. Samuel Hannemann, had discovered the principles of Homeopathic medicine ~ namely that “Like cures like”. It can be said Jenner tried copying this principle of Homeopathic medicine but failed to fully understand it. Jenner failed to dilute the infectious material according to Homeopathic principles and instead caused the patients (his son being one of them who later died from the cowpox) to become ill and/or die. Another difference is in homeopathic medicine, the “remedy” is taken orally and held under the tongue. It is absorbed through bucol cells in the mouth while being acted upon by the humoral immune system. Vaccines are injected directly into muscle tissue and therefore does not allow for a humoral response. 1 study recently published describes the pathway of the injection of a vaccine and the pathway to the brain in detail for the first time. Vaccination is an unnatural method and does not contribute to effectively protecting the recipient.